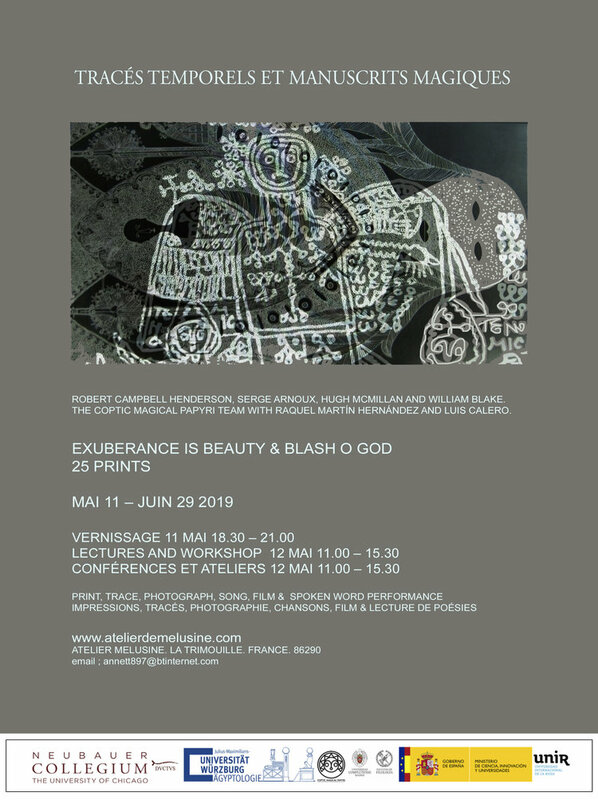 We are very pleased to be able to announce our first public event, an exhibition titled Tracés temporels et manuscrits magiques, which will be held at the Atelier de Mélusine in La Trimouille, France. The exhibition will consist of 24 tracings of drawings from Coptic, Demotic and Greek magical papyri, produced by our team members in collaboration with Dr. Raquel Martín Hernández whose project, To Zodion, is dedicated to such images. These prints will be accompanied by music created for the event by Dr. Luis Calero, an expert on ancient Greek music and performance, as well as a soloist singer, who has recorded reconstructions of the Hymn to Typhon from the Greek magical papyrus PGM IV, and the Oxyrhynchus Hymn, the oldest piece of Christian music whose notation survives. These ancient artworks will be juxtaposed with more recent creations – a series of copper plate prints illustrating William Blake’s Proverbs of Hell by the mid-twentieth century French artist Serge Arnoux, reprinted in 2019 by Robert Campbell Henderson, as well as a multimedia collaboration between Henderson and the poet Hugh McMillan inspired by the life and death of the Scottish prophetess Elspeth Buchan. The exhibition will open on 11 May 2019 and last until 29 June 2019. Together with Dr. Raquel Martín Hernández, we will be running a lecture on the study of ancient magical images, as well as a workshop of experimental archaeology, producing papyrus amulets, on the 12 May 2019. Places will be limited, so if you’re interested in attending please contact Sally Annett at annett897@btinternet.com, the curator of the gallery, to reserve your place.